System Platform 2017 introduced InTouch OMI, the first Operations Management Interface to leverage both Human Machine Interface (HMI) and Supervisory Control and Data Acquisition (SCADA) systems and deliver a next generation visualization experience. InTouch OMI extends traditional HMI and SCADA applications to deliver a convergence platform for both Operational Technology (OT) as well as Information Technology (IT). This update to System Platform 2017 extends the features and functionality of InTouch OMI, including the ability to use InTouch Access Anywhere to access run time applications. One key aspect of InTouch OMI is its ability to automatically assemble applications based on a data model, resulting in minimal engineering and manageability that has not previously been available. InTouch OMI enables the first industrial application that will deliver a tailored and contemporary experience to any environment or device, including control rooms, industrial panels, desktops, laptops, tablets and phones. A Software Development Kit (SDK) is included to allow programmatic additions to InTouch OMI. Help for the SDK can be accessed from the Start Menu, under Wonderware Documentation. InTouch OMI includes new functionality that lets you see how a symbol wizard linked to an object wizard is configured as you add it to an overview symbol or to a pane. In previous releases, only the default configuration was shown unless the symbol was contained in an overview symbol. InTouch HMI: Using a symbol wizard linked to an object wizard is not supported in an InTouch HMI application window, either during configuration or at run time. The new functionality applies only to using an object wizard with a linked symbol wizard within an InTouch OMI pane. 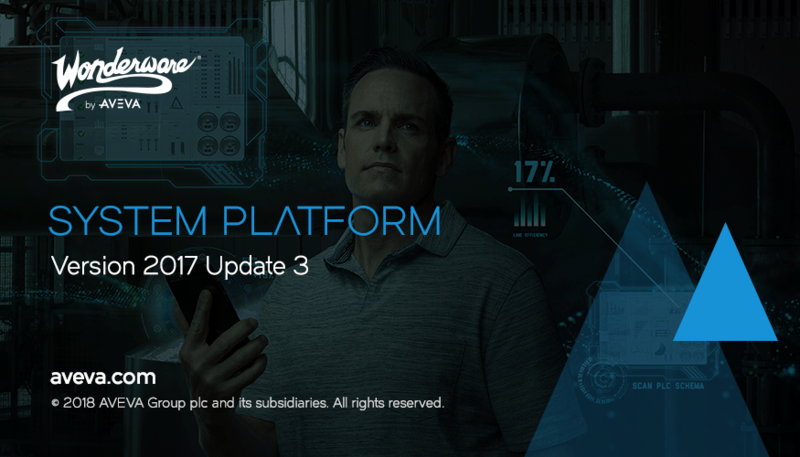 System Platform 2017 Update 3 adds new product features and includes several measures to enhance security, including the secure SuiteLink connection. The secure SuiteLink connection, enabled with TLS 1.2 protocol, encrypts the communication channel between the SuiteLink Server and SuiteLink Client. A secure SuiteLink communication channel must establish the TLS Handshake, key exchange and server certificate validation. The ArchestrA Service Bus (ASB) Security supports secure communication using the TLS protocol and digital certificates. Use the Configurator to configure the ASB security on every node. For more information, refer to the section, ‘Configuring ASB Security’ in the System Platform Installation Guide. To ensure interoperability, the secure SuiteLink infrastructure continues to support and allow both secure and insecure communication. Only a secure client and a secure server will provide secure and encrypted communications. An unsecure endpoint (either client or server) prevents secure communications between the nodes. If the authentication fails between the Client and the Server, or if the Client or Server do not have access to the Certificate store, the system continues with the unsecure and non-encrypted connection as a fallback. For detailed information about the secure SuiteLink connection and how to configure it, see the ArchestrA Protocols Users Guide, installed on your local computer and available through the Windows Start menu. Also see the Wonderware Operations Integration – Core Communications Driver (G-3.0 Series) Help, available through the System Management Console (SMC) online help system. Each node contains a Sentinel Agent that constantly monitors the License Server to ensure that it is accessible. In the event that a node is unable to communicate with the License Server, the Sentinel Agent sends a message to the Sentinel Manager. The Sentinel Manager can be configured to email a warning so you can quickly fix any issues and ensure that operations are not interrupted. The AVEVA Digital Exchange is a new online marketplace that lets you explore products and offerings from a problem-first perspective, or from an industry/vertical perspective. You can download new InTouch OMI apps and other System Platform enhancements. A new Galaxy Import menu item has been added to the ArchestrA IDE that lets you import an app directly into your galaxy. When Historian or Application Server Galaxy Repository is selected for installation, the Security Server component is automatically selected for installation on the node. The Security Server supports single-sign-on and provides secure, encrypted communications between nodes. This improves the overall security of System Platform against external threats, such as man-in-the-middle attacks. To further enhance security, the ArchestrA User Account no longer requires elevated system permissions. This account is used for communication between various System Platform components. New security attributes let you use configure automatic logon and logoff for ViewApps. The Windows credentials of the currently logged-in Windows user can be passed to the ViewApp, without the user having to re-enter their credentials. Users can be automatically logged off after a period of inactivity. You can configure a timer that shows the user how much time remains before they are automatically logged off. ViewApps can be set at configuration time to be read-only. If set as read-only, a ViewApp can only be changed to read/write from the IDE. Users cannot change this setting while the ViewApp is running or when launching the ViewApp. In previous releases, when an Object Wizard was used to add a symbol to an overview symbol, and the symbol included a Symbol Wizard, the symbol had to be placed in a container overview symbol or it would be shown with its default configuration, regardless of the selected settings. The need to use a container has been removed in this release. The symbol is now displayed according to its configuration. Note that this behavior change only applies to what is seen while configuring symbols. Symbols always displayed correctly at run time. A symbol wizard linked to an object wizard in an InTouch application window will not show the correct settings during configuration or at run time. The new behavior only applies to adding linked symbols to an InTouch OMI pane. To simplify setting the owning object in multi-galaxy environments, you can now include the galaxy name from within the Graphic Editor. Previously, scripting was needed to set the owning object in multi-galaxy environments. Support has been added for touch and associated gestures within InTouch OMI apps. Some InTouch OMI components, such as the search textbox and NavTree, have touch already enabled. You can configure your ViewApps to respond to touch to simplify user interactions during run time. You can also build your own touch-enabled apps through the InTouch OMI SDK. In addition to executing legacy InTouch HMI applications, InTouch Access Anywhere now lets you execute InTouch OMI ViewApps. Enjoy the same mobility and utility that InTouch Access Anywhere provides for your legacy applications with InTouch OMI ViewApps. You can allow your run-time users to search the navigation tree (NavTree) to quickly find items within the tree. Just enter a search term in the search bar, and immediately navigate to the item you are looking for. The search bar can be disabled, if preferred. The InTouch OMI Alarm App now allows users to filter content by area, for both live and historical data. This exposes the area model to users so they can select any node to see the alarm grid view. The properties available in the ArchestrA Alarm Control can be accessed with the InTouch OMI App. Some of the properties that can now be configured and used include Alarm Query, Asset Browser, Context Menus, as well as parameters for controlling the appearance of the grid. At design time, an application engineer can configure the InTouch OMI Alarm App to automatically show alarms from either the current area or the current asset, based on what has been selected in the navigation pane. The alarm query of the AlarmApp can then determine which alarms should be displayed. A button can be added to a ViewApp to allow users to quickly respond to alarm states. Users can be given the ability to acknowledge, silence, enable/disable, and other interactions, such as Acknowledge with just the push of a button. As users navigate through the system, they can now load pens associated with different objects. This allows them to view trends for a selected asset, through the InTouch OMI Historian Client App. Support has been added to the graphic library to allow InTouch OMI ViewApps to utilize hyperlink animation and the hyperlink script function. Halo animation can be configured to appear when the user places a mouse cursor directly over a graphic element while a ViewApp is running. The halo highlights the current interaction focus within a ViewApp.The halo follows the boundary of the graphic element, which is configured with any user interaction animation. Specific areas of symbols shown in a running ViewApp can be zoomed in to show more detail. Instead of focusing on the center point of the pane when zooming in, the center point of the zoom area can be specified in a script. The ability to place the zoom area center point anywhere within the boundaries of a symbol lets you set which specific portion of the symbol to show more detail. Support has been added for external content that you have developed outside of System Platform. You can now link to this content and display the linked content within an InTouch OMI viewer app. Advanced numeric formatting styles that were developed for InTouch HMI applications are now supported in InTouch OMI ViewApps. Applications and graphics that leverage advanced numeric formatting will automatically update during run time, whenever the galaxy configuration is changed. InTouch HMI 2017 Update 3 provides support for the latest versions of Microsoft products and includes several new features. Refer to the GCS Technology Matrix for the list of supported Microsoft products. The following section summarizes the major features introduced in InTouch HMI 2017 Update 3. There are major improvements in the InTouch Web Client since the InTouch HMI 2017 Update 2 release. Major improvements in graphics visualization. Web Trend Client: A HTML5 compatible trend client that displays real-time data. Web Alarm Client: A HTML5 compatible alarm client can be displayed on the web client. Web Alarm Client will replace any EAC controls and also support EAC configurations. Alarm Border Shelved: The Alarm Border animation for shelving and unshelving alarms is displayed as expected on the web client. Connector and connection points: All connector and connection point are supported on the web client. Https support: The Web Client can now be launched using the https secure communication protocol, provided the certificate is configured using the Configurator. Hyperlink animation: You can now launch a website from the Web Client using the new hyperlink animation. Web Client Data Display Refresh Rate: You can now use the Configurator to configure the data Refresh rate for the Web client. Graphic Share Capability: A Share button in the Web Client provides a HTML5 code snippet to embed a selected symbol in an iFrame. A new animation that allows you to launch a browser with a configurable URL. You can use the standard FillColor property to fill the area under the Trend Pen curve in design and runtime. The Push down animation in InTouch HMI standalone applications now support the touch gestures for touch enabled devices. You can now launch InSight Publisher from Application Manager and WindowMaker. You can also publish applications to InSight servers provided InSight is configured and licensed. The cross reference dialog box is now modeless allowing you to use other functionalities of InTouch WindowMaker while the cross reference dialog box is open. To ensure interoperability, the secure SuiteLink infrastructure continues to support and allow both encrypted and non-encrypted communication. Only a secure client and a secure server will provide secure and encrypted communications. An unsecure endpoint (either client or server) prevents secure communications between the nodes. The SliceBy parameter allows you to retrieve data based on another tag time slices. For example, you could retrieve a tank’s temperature average based on batch durations. For details, see the Wonderware Historian Retrieval Guide. In Historian Insight, dashboards are configurable. You can customize the size and position of cards in the dashboard.